A pet peeve of mine is when bloggers mistakingly interpret Technorati’s Top Blogs list as a measure of a site’s relative traffic. This is not what it measures. 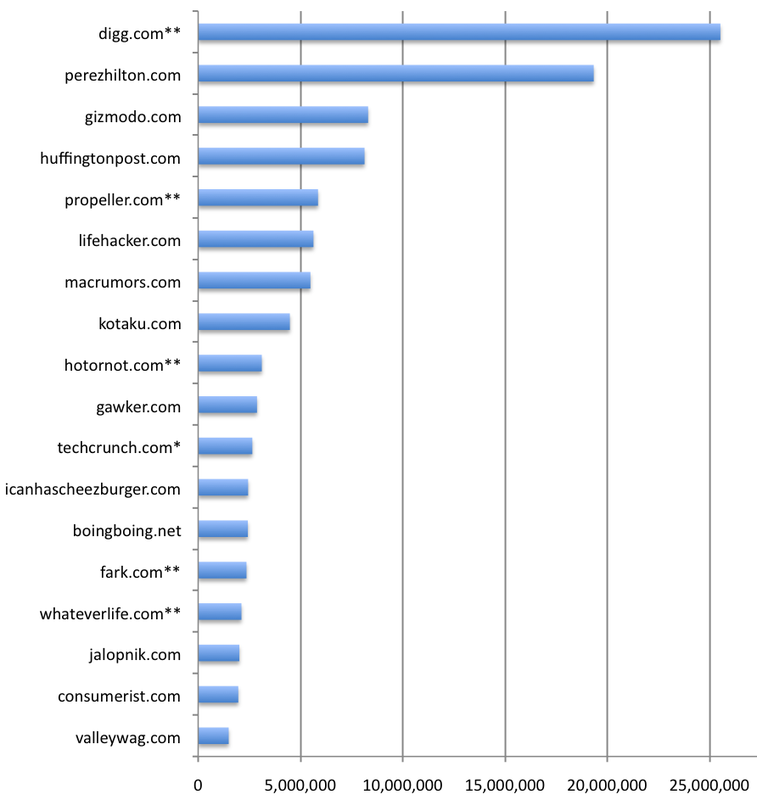 Technorati’s Top Blogs list measures the number of inbound links, not traffic — though there may be a loose correlation. As a side effect of this list, TechCrunch, which is near the top of this list, is frequently cited as one of the most popular blogs on the internet. I have nothing against TechCrunch, and certainly agree it’s amongst the most influential blogs, but in terms of pure traffic, it’s very respectable, but not at the top of the list. The problem in determining relative traffic amongst blogs is that relatively few sites publicly broadcast their traffic stats. Instead, we’ve had to rely on expensive ComScore stats (not very accurate), or public trackers, such as Alexa and Compete — also notoriously inaccurate. So, I’ve compiled a list of well known blogs that have public measured (not estimated) traffic information (via Quantcast) and added in TechCrunch’s self reported numbers as well. I’ve also included a few non-blogs as points of reference. These include: digg.com, propeller.com, whateverlife.com and hotornot.com. This is not an exhaustive list. Only sites that publicly report their numbers are shown. Most blogs keep their traffic figures private. * TechCrunch stats are from January 2008, reported in their blog. ** these are not blogs, but included for reference. Some interesting notes about some of the sites on the list. WhateverLife.com – started by a 14 year old. Now an emancipated 17 year old. Turned down a $1.5 million offer for the site, and appears to be doing quite well. HotorNot.com – acquired for a rumored $20 million. Was reportedly making millions a year through their dating service. Icanhascheezburger.com – a LOL cats site started by Eric Nakagawa in January 2007 who now works full time at his site. Overall, an interesting perspective. I think we tech web folk get caught up in our own little worlds, and should realize that a site like PerezHilton attracts over twice the number of unique visitors in a month than the very popular Gizmodo. $1.5m offer at 14. I would be dead by now.